We do things a little bit differently on the Bayou. From our friendly staff to our volunteer board of directors – everyone is working to make your financial future a little sweeter. We like to keep it local. Chocolate Bayou Credit Union has been serving our community for over 55 years. Headquartered right in the heart of Alvin, Texas, we help local families and businesses build brighter financial futures – whether that means loaning a farmer money to buy a new tractor or providing tools to help a single mom save for a family vacation. When you contact us, you’re dealing with a local person whose only interest is helping you. 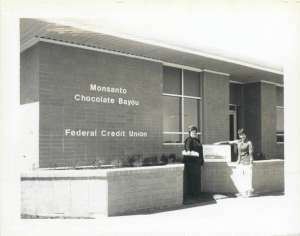 Chocolate Bayou Credit Union’s rich history dates back to July 13, 1962. We got started when seven employees of the Monsanto Chemical Company (located right on the Chocolate Bayou) decided to pool their savings in order to lend to one another. Over the years, additional service groups gained membership eligibility, including employees of Conoco and Alvin Community College. Today, we serve over 13,000 members who live, work, or worship in Brazoria County. Unlike other financial institutions, Chocolate Bayou Credit Union is owned by its members, governed by a volunteer board of directors, and staffed by financial service professionals.